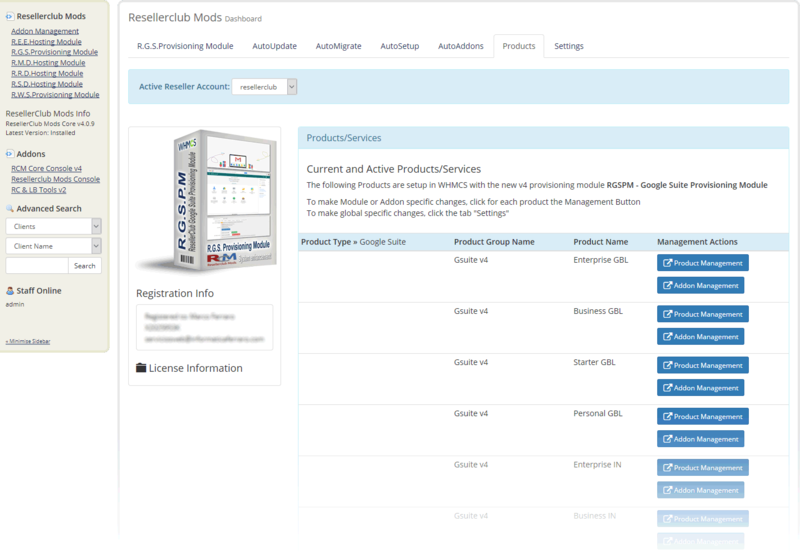 Download RGSPM - Google Suite Provisioning Module from the product license details page TAB "Downloads". Unzip the file with your prefered decompresion software. Upload the complete folder "modules" from the unzipped local folder \rcmrgspm_X.Y.Z_PHP_5.X\ into the whmcsroot/ folder. The "whmcsroot" folder is where you have installed your WHMCS. 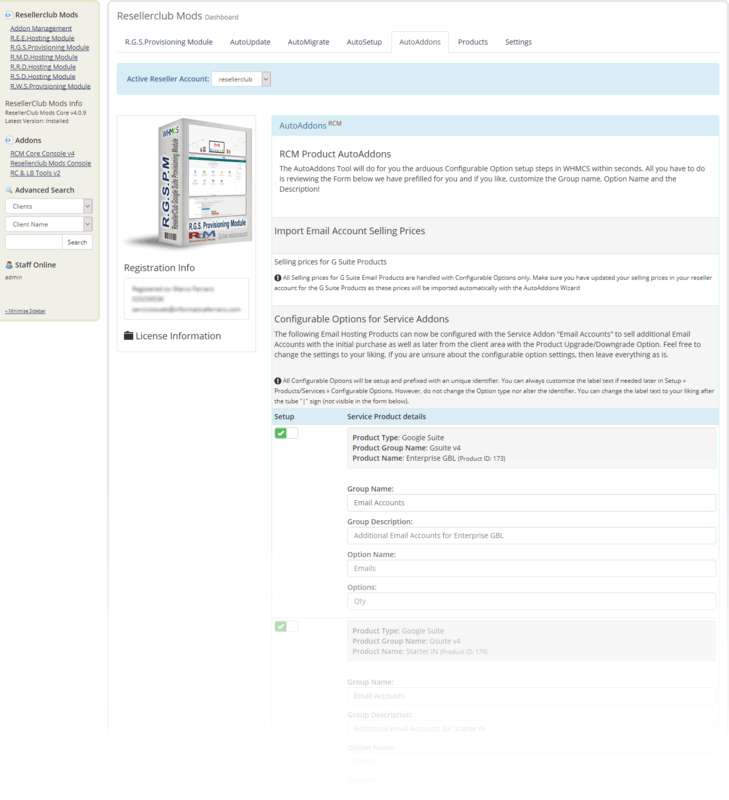 Goto to WHMCS » Addons » RCM Core Console v4 and access the R.G.S.Provisioning Module Dashboard from the left sidebar Addon Menu or from the Core Addon Home widget and click the "Validation" Button below the license details to finish the manual install. 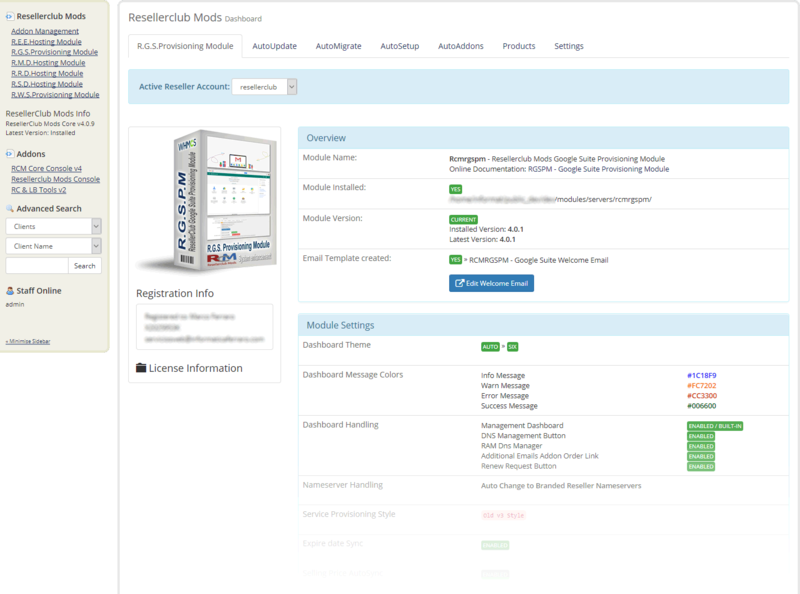 To manage the Module, navigate in WHMCS to » Addons » RCM Core Console v4 and access the R.G.S.Provisioning Module Dashboard from the left sidebar Addon Menu or from the Core Addon Home widget. 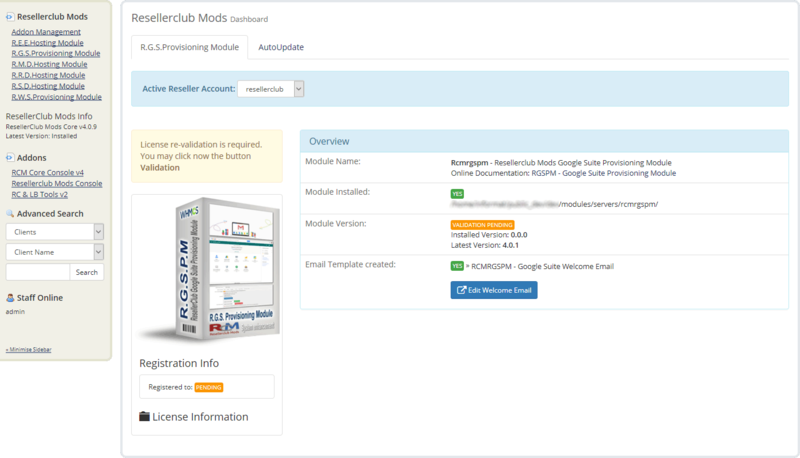 If this is the first time you install our Module to sell and manage Google Suite Plans, then start right away with the AutoSetup Guide. Once you have setup all Products you would like to sell, proceed with the AutoAddons Guide. Before you can migrate your current Services to the new v4 Module you need to setup first all geolocated Google Suite Products and Configurable Options. Start with the AutoSetup and AutoAddons Guide. Once you have Setup Products and Configurable Options, proceed directly with the AutoMigrate Guide to move all current services to the new v4 Module. Whenever we release a new update you will be notified instantly by accesing the Management Area in TAB "R.G.S.Provisioning Module". From TAB "AutoUpdate" all you need to do is click the Update Button and the Module will be updated automatically to the latest available stable release. 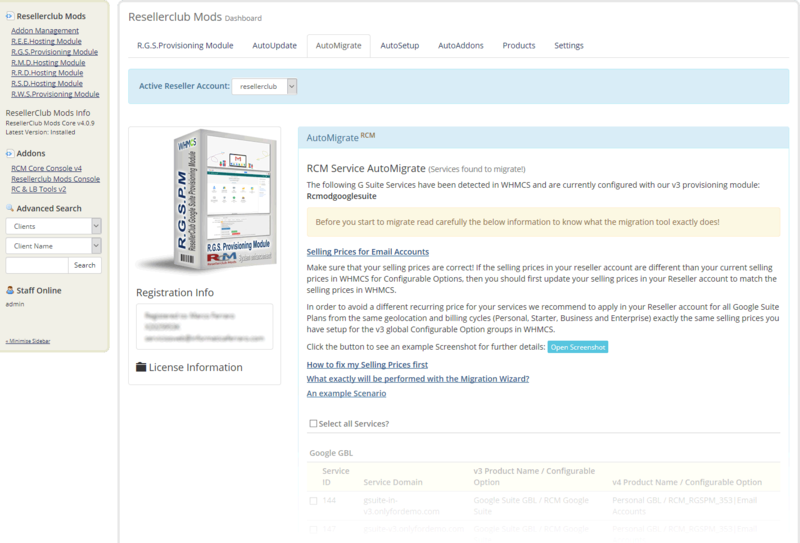 Goto to WHMCS » Addons » RCM Core Console v4 and access the R.G.S.Provisioning Module Dashboard from the left sidebar Addon Menu or from the Core Addon Home widget. Click the "Validation" Button below the License Information to finish the manual update. Note: All Google Suite Base Products will have a selling price with 0.00! Selling prices are handled exclusively with Configurable Options for Email Accounts. This tool will create the required Configurable Options to sell Email Accounts for each Google Suite Product. These Configurable Options are mandatory and required to sell Google Suite Services. Unlike the new v4 module, all Products have shared the same Configurable Option using the old v3 module with a single Base Product Setup for each geolocated Google Suite Service. 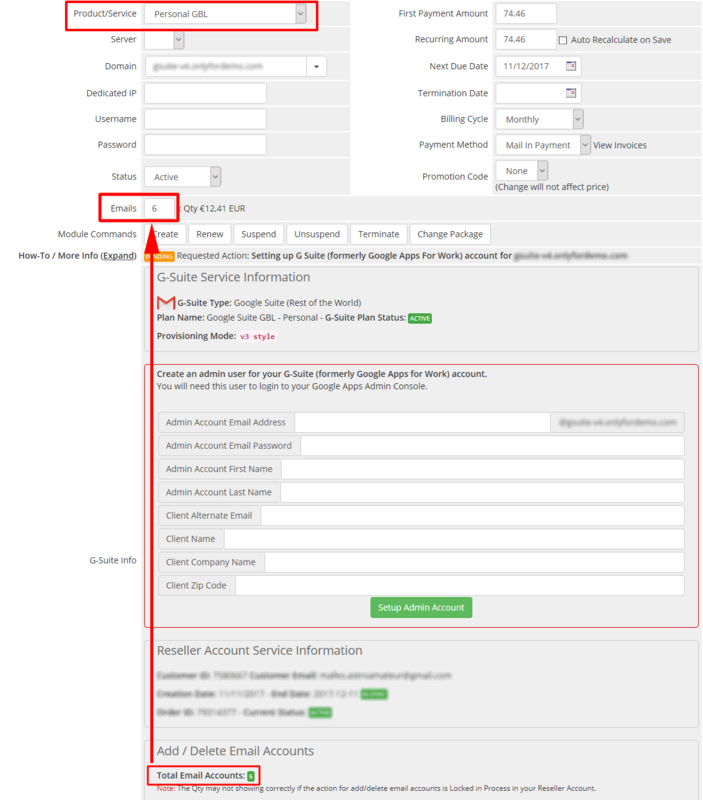 The base Product for a Google Suite Service was including by default always one Email account and additional Email Accounts were offered with a unique single Configurable Option for each geolocated Base Product. With the new v4 module you offer now 4 Plans for each geolocated Google Suite Product. Each of the product will have its own Configurable Options with a minimum and maximum of Email accounts. 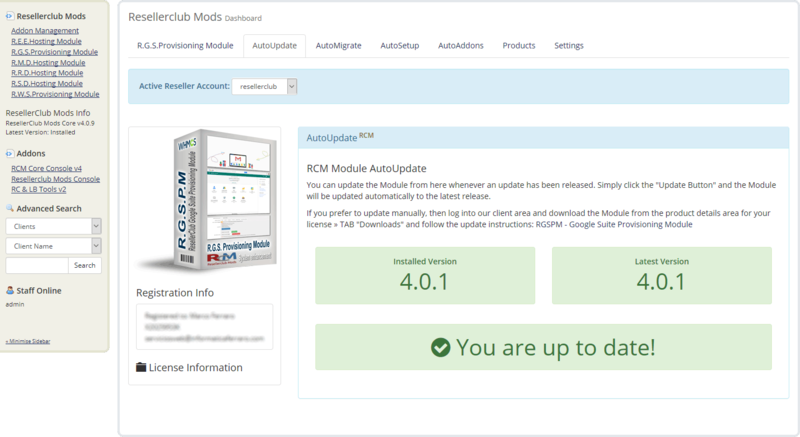 Navigate in WHMCS to » Addons » RCM Core Console v4 and access the R.G.S.Provisioning Module Dashboard from the left sidebar Addon Menu or from the Core Addon Home widget. By default, the new v4 module offers now for each geolocation 4 Plans with a minium of Email accounts included (Personal, Starter, Business and Enterprise). The new provisioning style offers a way to sell quantity based Email account Plans and allows you to configure different prices for each Configurable Option Group. The following Guide below shows you how you can sell Google Suite Products like before with the old v3 Module using only one Base Product with one Configurable Option Group for each geolocation. 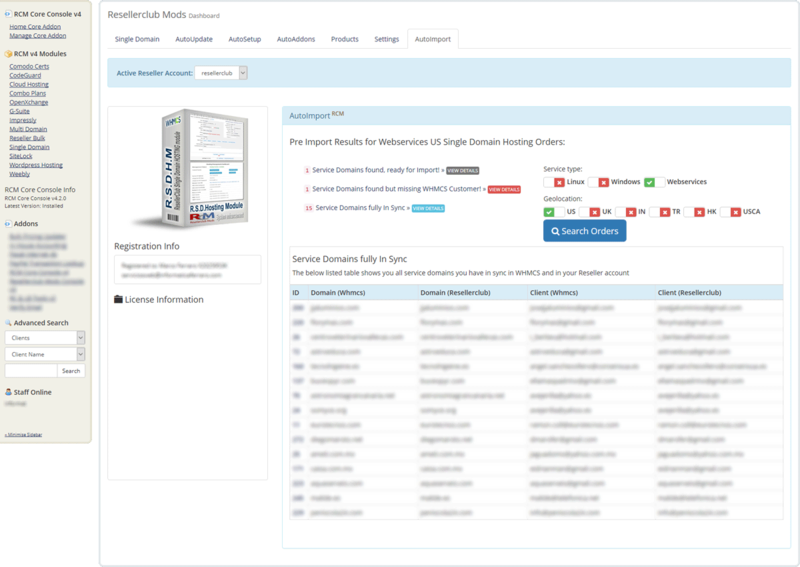 Goto WHMCS » Addons » RCM Core Console v4. 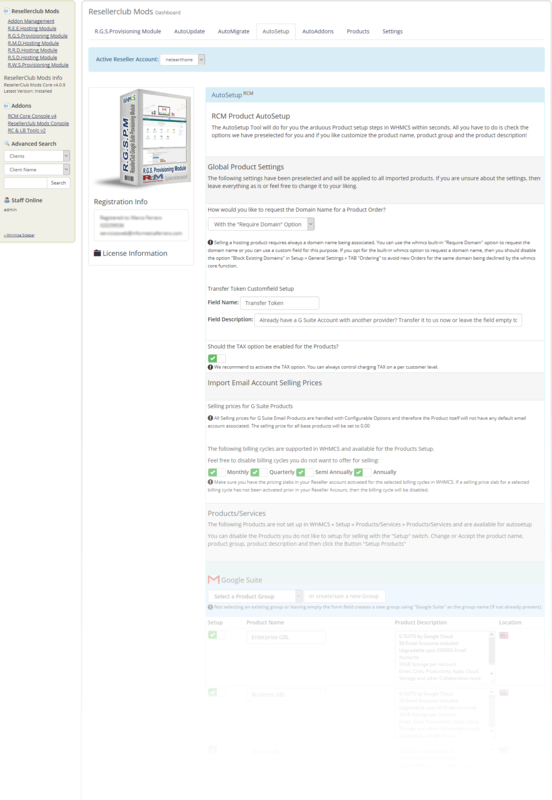 From the left sidebar menu click the link R.G.S.Provisioning Module and then click the TAB "Settings"